In this post we learn how to use an NTC in circuits for suppressing surge current during power switch ON. We also learn the datasheet and the electrical specifications of an NTC. Today electronics is getting more and more compact and light weight, it's basically due to the involvement of compact converters which have completely eliminated the age old iron cored transformers. However this had to come at a cost, these units became too vulnerable to switch ON power surges. But electronics always has appropriate answers, whatever may be the issues. NTC thermistors were created exactly for tacking this, that is in-rush surge currents during power switch ON. These are incredibly perceptive to heat change, very precise and interchangeable. packed to be used in damp conditions also. * Significant element constant (B value), minimal stay resistance. An NTC is attributed with a special property through which it is able to raise its resistance significantly during power switch ON. When used in electronic circuits this property helps blocking the initial surge currents in to the connected circuit. However in the process, the NTC becomes relatively warmer, which brings down its resistance to lower levels such that the normalized safe power subsequently is allowed to pass over to the adjacent circuits. * Many vulnerable electronic circuits, power supply circuits etc. The first digit "5" indicates the resistance of the part at normal conditions. Here it indicates 5 Ohms. The subsequent alphabet and the digit indicate the diameter of the particular part, here it's 11mm. Normally in an electronic circuit an NTC is connected at one of the mains inputs, in series. Alternatively, it may be also connected after the bridge rectifier, as shown in the following examples of surge controlled compact transformerless 1 watt LED driver circuits. Can I connect a NTC on above update circuit diagram. Which type of wire I will be use for led series. Please sir give me a hints about wire size, which is perfect for led series. you can use any flexible wire. What is the value of NTC for 90 LEDs. 1). I think “275VAC, X2” BOX TYPE ( specially designed for AC supply ) capacitors safely inplace of highvoltage rated 400V dropping capacitor. What is your openion. 2). Is it three terms are same or different….Surge current , Spike and Zero-crossing, related with capacitive supply…? I assembled the first circuit before one year, with my own modifications. Circuit worked perfectly. I used one 20mA high brightnes blue LED. My dropping capacitor was only a 224P, 630V Polyester type. I added a 9V, 1W zener diode at output and 1K resistance series with LED. 56ohms, 1W surge/spike limiting resistor replaced with 100ohms, 1W. VERY USEFUL MODIFICTION……..the capacitor 1mfd, 250v electrolytic parallel with LED, I USED A 2200mfd, 16V ELECTROLYTIC CAPACITOR. This modification is highly useful at sudden powerfalure situations. Due to the holding charge inside 2200mfd (you can use high value, such as 3300mfd, 4700mfd etc.) LED will stay ON morethan 2 minutes after you switch OFf circuit /powercut, and gradually OFF the LED. I removed all parts of a burned CFL and inserted your circuit inside it’s cover. If it is difficult to fix a single 4700mfd inside CFL cover, use 1000mfd x 5 pcs parallel. This will save space. 1) There’s no specially created AC or DC capacitor, as long as the voltage rating of the cap is well above the supply peak it is well suited for that application…and for AC it must be a non-polar. 2) A surge may happen during a spike in voltage, because current will only surge when there is a sudden increase in voltage. zero crossing is the period when the AC wavrform is passing through the zero level of its waveform, switching a gadget during this point is considered to be the safest because the AC is in its most weakest level at this zero crossing point. for enabling a emergency light effect you can increase the series resistor value of the LED, which will further increase the backup illumination of the LeD during a power failure. the 1uF in the diagram is correctly shown, it can be a polar or non-polar doesn’t make any difference, I have shown it as a non-polar because a non-polar capacitor is more commonly available in the market and is more compact than an electrolytic. is a type of capacitor that has no implicit polarity — it can be connected either way in a circuit. sir is there any circuit which can supply dc to a circuit for 1 min only when allready connected dc supply is intrupted for very short periods like 40 sec ,1min . i want system like ups but for very small circuit like 555 timer 12v circuit. i want this supply system max for 1 min not more than that. sorry I am not sure about the calculations, it could be a bit complex. than can u plz suggest me ntc or ntc rating for given details.. 3hp motor inrush current is 40amp runnnig current is 14amp voltage is 230 single phase. is thereany formula you can suggest with example? the wattage looks unnaturally huge. since you would want to use it only for a split second, a relatively smaller wattage resistor could be tried. Hi, The inverter consumes more current because the printer asks for it, if you don't allow the inverter to take current from the battery, the printer will not start normally. moreover an NTC is designed to handle current only for a few milliseconds. beyond that it itself might get burnt or get destroyed so it cannot be applied for your application. Initially at power switch ON the NTC resistance will be higher, since its temperature would be lower, however after power switch ON the NTC will gradually heat up due to cuurent flow through it enabling it to lower its resistance until eventually it reaches to its specified level. A relay bounce cannot have any significant effect on an LED if the LEDs are protected with a limiting resistor or with some other form of current limiting stage. Great i take a lot of my time and moments to find how block surge current in sircuit but when i see this article i am got woundered really a ntc can be candidate as final option in capacitive power supply i understand it and make it good. Thanks! I am glad it helped you! This article is very useful to me as i have seen only on PC SMPS and i was wondering what this component was but now i know what it is, thank to you sir. Sir i have a SMPS @450watt which the fuse was blown, so i replaced the exact fuse rating(5amp-250V) but when i turned the SMPS on the NTC was blown, i can't find the exact NTC rating which is "1F-72 5D-9" so sir can i replace it with this one "NTC 10D-9" Thank you. According to me it's only during the initial power switch ON when the capacitor is fully empty, and acts like a short circuit when introduced to mains inrush. During this time it gets charged to the mains level with the first cycle, and subsequently the opposite cycle only discharges the capacitor to the level as determined by the load specs, if the load is 12V rated then the capacitor is now discharged and charged at this limit, until it's switched OFF and switched ON again or if there's a major voltage fluctuation. 1) The surge current will be always equal to the maximum AC mains input current…so it could be 200amps or even 1000amps, but it's not the amp value which becomes crucial rather it's the period for which it's allowed to pass through the capacitor, this in turn depends on how quickly the capacitor gets charged. Lower value caps will charge quicker than higher value caps producing quicker charging and consequently lower average surge current….which could range normally in microseconds. 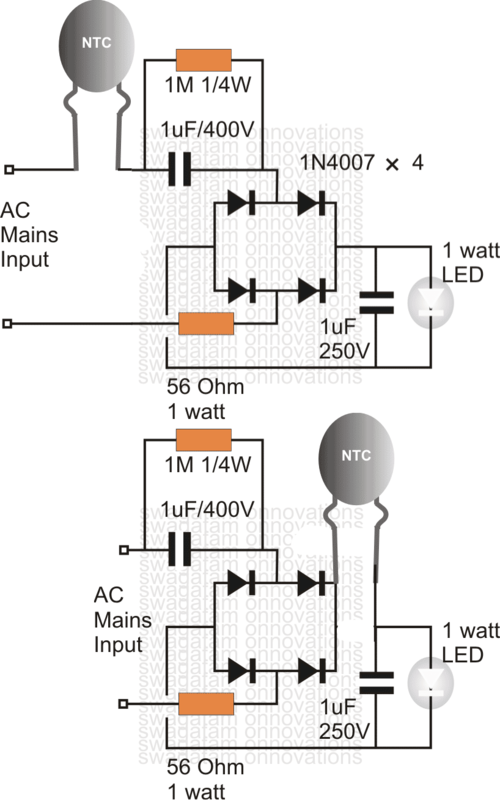 2) I am not entirely sure about the NTC current but mostly it could be within 1 amp at 220V…so it's better to install at the 220V side of the circuit. Can i use ntc directly in series with my half bhp water motor? 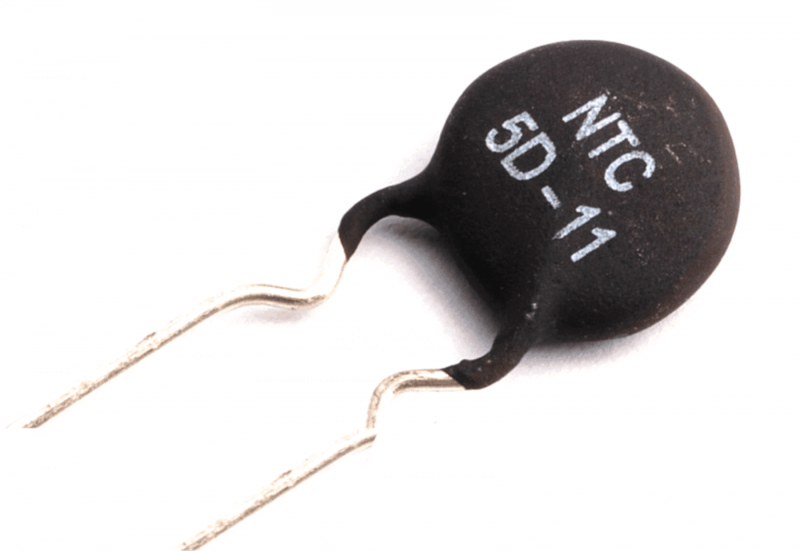 Presently i have ntc 10d9 22d9 and 33d9 in my stock. Can i use them? If not please suggest any suitable. Can i directly connect one ntc in series with my half bhp water motor? Presently i have ntc 10d9, 22d9 and 33 d9 in my stock. Can i use them? If not please suggest any suitable. No, the NTC is for low current applications, it won't be able to handle 0.5 hp motor….you may have to employ a PWM soft start kind of circuit for implementing the high initial current surge protections. Thank you for your advice on how i say it does not compensate. The only thing I can do. Can I pray for you. You always have wealth. there's no way to check whether an MOV is actually working or not,,,,but in most cases it will perform as expected from it. pray for the world!…God bless you! Can i use MOV 10D471k or Which value would be safe to use? Satheesh, please check the clamping voltage of the MOV from its datasheet….if it's around 330V to 400V it would be fine. Hello sir, I have a charging fan that uses NTC 10D-9 in its power supply. It was a new fan and it worked fine for one month and after that its fuse burnt out so I replaced it with new one but the new one burnt out as soon as I turned on the switch. I have tried to search for the short circuit but there is any short circuit. now I believe that it is because of NTC it is not limiting the current. can you please guide me that what ever i m believing is right ? Hello Aneel, an NTC is connected in series to the input line, so it cannot be a cause of a short circuit, still you can remove it and check by connecting a 100 watt bulb in place of the fuse, if the bulb glows and the fan does not move, then surely your fan could be the culprit. 1.can I put only 20 or 25 LED(5mm) in the circuit? 2. Sir can you more better (1or2watt)LED circuit ask me? 1. How many give LED(5mm) in this circuit? 2.Can you a very better LEDcircuit ask me? I have got thermistor DSC(10 D-13).can I change c2(1uf 400v). I think your local retailer will know better regarding a standard equivalent, or alternatively you can try using a hand wound coil for obtaining the same results. wind 500 turns of any thin super enameled copper wire over an iron bolt and use in series with the LED. Hello swagtam , bro I have 1 9w led driver I want to add ntc in this for better protection. Can u plz tel me where I can ad ntc in main connection on phase or nutrel actually on line point it already have fuse resistance so cn I ad ntc on nutrel point. ?plz clear my doubt. Hello Manoj, An NTC can be added on any of the input terminals, whether it's phase or neutral doesn't matter, you can even connect it in series with the fuse, nothing is critical as long as the device is in series with the supply line. May be you did not understand what I suggested in the previous comment. In capacitive power supplies using less number of LEDs will reduce efficiency and light….using more number of LEDs will improve. thanks Sir,I do as your answer ita woring very well. Harjot, using less number of leds in series will make the circuit less efficient and using more numbers in series will improve its efficiency. for perfect results you should go for an SMPS AC/DC adapter with a current control stage. Hello Harjot, presently i don't have but I'll try to post one related article soon, if possible…. Put NTC in the second circuit and use it for getting best results. I need this circuit use for 7 or 9 High Power LED in series, so what I need to changed. only the resistance power increased or change the value as well????? connect the leds in series, no changes would be required, use it as it's given in the diagram. can i put 10sp 005 thermistor in that Circuit? I already have that.. I can't interpret its resistance value, you can try it, because slight variations in the resistance won't affect the circuit outcome shown above. What Is the resistance value of that NTC…..
Avik, The one which is shown in the diagram is exactly what is required for this circuit….. in fact it's suitable for all 220V operated circuits. I don't think it can be measured with a DMM, we have to depend on the manufacturers spec sheet for knowing the details of these devices. …sorry could not understand the second question? here we need to exploit the voltage rather than the current, because here we have plenty of voltage and less current. Avoiding current means avoiding surges, so we have to thing of using minimum current which can be achieved by connecting LED in series. For 20 watts instead of using a single LED, we can go for 20nos 1 watt LEDs in series, that would restrict the max current need to 300ma, quite achievable with smaller caps. Next we also need to employ some sort voltage regulation by including 7812 or similar device in the circuit. yes it can be a good solution to the ever present surge problems in capacitive power supplies, I'll try to come up with a suitable circuit soon, and update in this blog. No adding more caps will not help much unless you make the total forward drop of the LEDs to near 220V. I want to use ten 1watt led.can the above circuit is capable of this. I am fine Avijeet, thanks! The above circuit will illuminate 10 one watt LEDs in series but the glow will not be optimal due to lower current from the cap, yet still it would be considerably dazzling. it's not critical, you may apply any value above 10uF, but the voltage rating should be above 50V preferably. yes 50 Leds 8mm will work with a 105 cap.